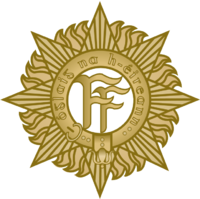 On the 21st of November 1991 I was sworn in as a Recruit in the FCA (An Fórsa Cosanta Áitiúil) which is the reserve of the regular standing army, the PDF (Permanent Defence Force). A Company - Collins Barracks, Cork City. B Company - Douglas Street, Cork City. C Company - Youghal, Co. Cork and Midleton, Co. Cork. On the 1st of October 2005 the FCA was officially stood down and and a new RDF established. This new Reserve Defence Force consists of the Army Reserve and Naval Reserve and consists of some 17,000 members. From this time the 23rd Infantry Battalion ceased to exist and was now to become the 34th Infantry Battalion. My current rank is that of 3 star Private. This page was last edited on 27 October 2018, at 12:39.